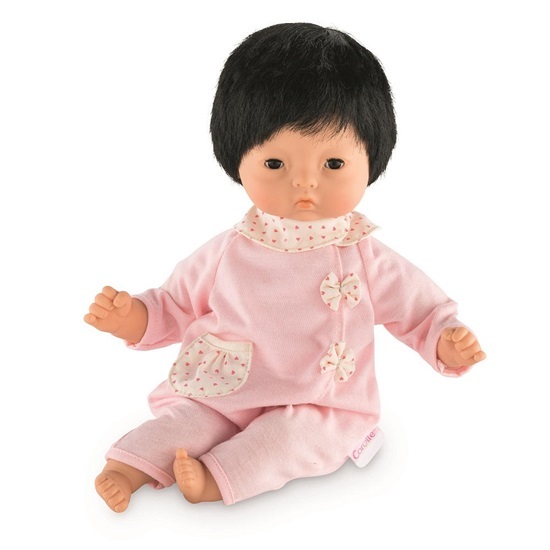 Judy's Doll Shop | Mon Premier Baby Doll "Calin Yang"
Mon Premier Baby Doll "Calin Yang"
This 12 inch baby doll is the perfect size for little arms to hold.. Created with the expertise, style and emotion that parents worldwide have come to expect from Corolle, "Calin Yang" is a small doll whose 12-inch size fits perfectly in your child's small arms and is ideal for hugging and cuddling. Its soft body allows it to take on the same positions as a real baby. The doll's face, arms and legs are made of soft vinyl. They are lightly scented with vanilla. With its sleeping eyes, it falls asleep when put down on its back. Mon Premier Bébé Calin Yang is dressed in adorable pink pajamas with a white collar and white bows with pink hearts scattered about them. A white front pocket with pink hearts adds the final touch to this snuggly ensemble. Calin Yang is perfect for 18 months and up.